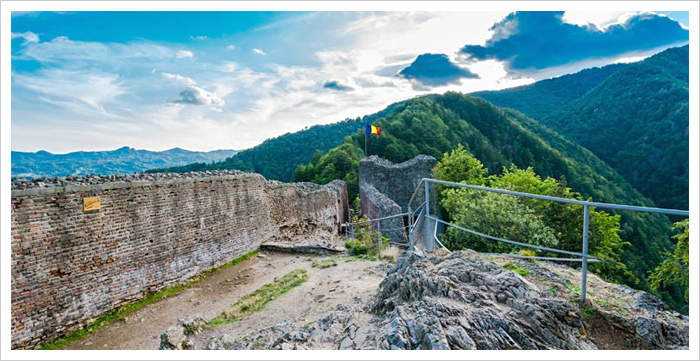 ﻿ Poenari Fortress - Castles and Fortresses in Wallachia, Romania. Visiting hours: Access is currently restricted; Bears roam in the area. only in presence of/ escorted by/ Forest Rangers. Vlad Tepes ( Vlad the Impaler) The ruins of Poienari Fortress stand high on a cliff overlooking the Arges River, at the foothills of the Carpathian Mountains. Built at the beginning of the 13th century by the first Walachian rulers, the castle changed names and residents a few times over the decades; eventually, it was abandoned and left in ruins. recognized the potential of the location and upon taking over the throne, he ordered that the structure be repaired and consolidated, turning it into one of his main fortresses. 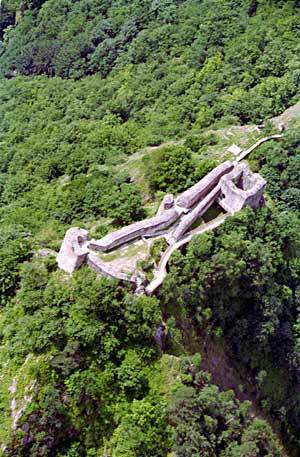 When the Turks attacked and captured the castle in 1462, Vlad escaped via a secret passageway leading north through the mountains. Although the castle was used for many years after Vlad's death in 1476, it was eventually abandoned again in the first half of the 16th century and left to the ravages of time and weather. In 1888, a major landslide brought down a portion of the castle which crashed into the river far below. The castle underwent repairs and the remnants of its walls and towers stand to this day. » Romania's Scenic Drives - amazing journeys to unique destinations!